Strong Signal of US Rate Hike? U.S. non-farm payrolls increased by 257,000 in January, capping a total gain of 1 million workers since November, the strongest three-month increase in 17 years. Wages jumped 0.5 percent, the most since November 2008. Data for November and December was revised to show a whopping 147,000 more jobs created than previously reported. At 423,000, November’s payroll gains were the largest since May 2010, when employment was boosted by government hiring for the population count. Private payrolls also increased in January, hitting 267,000. With November and December private employment numbers also revised higher, gains in November were the largest since September 1997. Manufacturing added 22,000 jobs in January and construction payrolls increased 39,000 after rising 44,000 in December. Retail employment increased 45,900 after braking sharply in December. Overall, the strong numbers puts a mid-year interest rate increase from the Federal Reserve back on the table. January marked the 11th straight month of job gains above 200,000, the longest streak since 1994. Japanese stocks rose after the yen fell 200 pips against the dollar as a surge in U.S. payrolls fueled bets the Federal Reserve will raise interest rates sooner. The Topix advanced 0.4 percent to 1,423.22 on Monday morning while the Nikkei 225 Stock Average added 0.3 percent to 17,701.83. Japan also reported a sixth straight monthly surplus in its broadest measure of trade in December, aided by stronger exports and a lower energy bill. The current account balance was in a surplus of 187.2 billion yen (USD1.6 billion), swinging from a 679.9 billion yen deficit a year earlier. This compares with a median forecast of 355.8 billion yen. Let’s look closer at the figures. Exports rose 19 percent from a year earlier, while imports increased 6.7 percent, leaving a trade deficit of 395.6 billion yen in December. However, the surplus in income generated from Japan’s direct investment overseas and holdings of foreign securities rose to 1.02 trillion yen, helping keep the current-account balance out of deficit. As a “almost 100%” pure oil importer, the value of Japan’s crude oil imports declined 22 percent in December from the same month a year earlier, aided by the sharp drop in oil prices, which have fallen by about half from last year’s high in June. The drop in the oil price should be quite positive for the Japanese economy, positive for real purchasing power for both the household and corporate sectors. In the US, the yield on Treasury two-year notes jumped the most since 2010 as investors reaffirmed expectations of an interest-rate hike later this year. The yield jumped 14 basis points after the Non-Farm Payrolls announcement. Ten-year Treasuries yielded 0.96 percentage point more than the average among their Group of Seven counterparts last week, approaching 1 percentage point for the first time since December. China: CPI y/y. Tuesday, 10th February, 9.30am. I expect figures to come in at 1.1% (previous figure was 1.5%). UK: Manufacturing Production m/m. Tuesday, 10th February, 5.30pm. I expect figures to come in at 0.3% (previous figure was 0.7%). Australia: Employment Change. Thursday, 12th February, 8.30am. I expect figures to come in at negative 5K (previous figure was 37.4K). 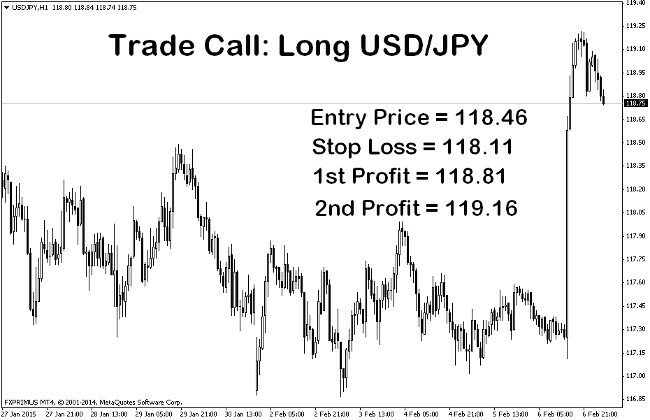 On the H1 chart, USD/JPY has surged upwards due to the strong US employment figures. With the upswing in US 10-year Treasuries and Japan’s reported current account surplus, I expect the uptrend on USD/JPY to continue. An entry is taken at 118.46 near the support level with a stop loss of 35 pips placed below the previous low. We will have two targets on this trade, exiting the first position at 118.81 and the second one at 119.16.